The design of the RS50 puts together durability, quality performance and power efficiency that will undoubtedly maximize productivity. CipherLab USA, a global leader in the design, manufacture, and marketing of Automatic Identification and Data Capture/Collection products and systems, will showcase its latest Android Mobility and Scanning Solutions at RetailNow 2017, booth# 304 at the Paris Hotel in Las Vegas, NV., from August 7 - 8, 2017. CipherLab will have the latest Android Rugged mobile computers and barcode scanners on display. 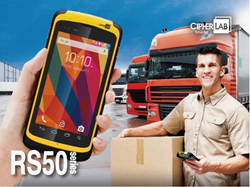 CipherLab proudly presents the RS50 Rugged Android Touch Computer to provide productivity that meets high-end market standards with a smartphone user-friendliness. Operating with Android 6.0 certified with GMS, the RS50 series offers advantages in operation speed, power efficiency and data security. Integrating GMS (Google Mobile Service), users can also access applications such as Gmail and Google Map in the field for maximum output.